Before you go on the long search for answers, you might have a quick look at our frequently asked questions and see if your answer isn't right here! The following questions are asked quite regularly so have a look. If you need more specifics on one of our features or are having problems using it, please check out the feature list below. Happy cutting! 1: I'M SELECTING DIFFERENT SETTINGS BUT NOTHING IS HAPPENING? Firstly, make sure that after making your settings, that you click on the "Preview" button at the bottom of the screen. Otherwise your image will not be processed by our computer. Every time you make an edit or change to your image, the "Preview" button needs to be pushed so we can update your photo! 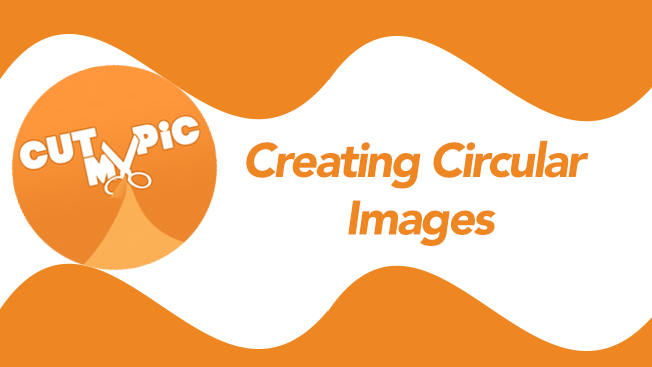 2: HOW CAN I MAKE MY IMAGE INTO A PERFECT CIRCLE? We get this question all the time! It's quite easy actually. Just two simple steps! First, slide the "Round Corners" slider to max (full-right position). Next scroll down to your uploaded image and select the "1:1" select ratio lock just above your photo and to the right. Once you have selected the "1:1" ratio lock, select the area you wish to keep and then click the "Preview" button. Your new circle shaped image should appear above. 3: WHY IS MY IMAGE ALWAYS SMALLER THAN THE ONE I UPLOADED? As all our processing of your image is done on our server, it is necessary for us make your image a bit smaller so we are not stuck with huge files. This service is free and we do not have unlimited disk space unfortunately to process huge image files. Perhaps in the future with more funding we will be able to make such changes. Until then, we are unfortunately stuck with the 500x500 size which is generally big enough for emails, blogs, Facebook, Twitter and other social services. 4: DO YOU KEEP MY UPLOADED IMAGE? 5: I WANT TO FLIP OR TURN MY IMAGE, HOW CAN I DO THAT? Just under your uploaded image preview, you will see four buttons. These four buttons do the following in this order. The first button will rotate your image 90 degrees to the left (counter clockwise). The second button will do the opposite, rotating your image 90 degrees to the right (clockwise). The third button is used to mirror your image horizontally. The last button will flip your image vertically (up-side-down). Currently, rotating and flipping your image requires a page reload so it's best if you can do this before modifying your image with the various tools and effects. 6: WHY ARE THE ROUNDED CORNERS DIFFERENT ON MY IMAGE THAN THE EXAMPLE? Rounded corners can be a bit tricky. On smaller images, the same amount of rounding applied to a larger image will appear more drastic and vise-versa. The indicator is just to give you an idea of the amount your applying rather than a preview of your actual final product. For most images, a small amount of rounding will suffice. However, to get the amount of rounding you are seeking may require you to play with that feature a bit and click the "Preview" button to see if it's the right amount. 7: WHY DOES MY IMAGE LOOK BLURRY WHEN I USE THE CUSTOM FRAMES? If your image appears blurry when using custom frames, it's most likely you are using too small of a source image. For the best results when using custom frames, try to use an image that is at least 500x500 pixels in dimension. 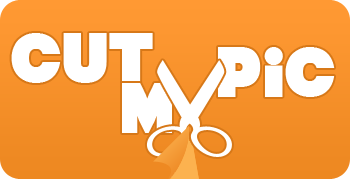 If your picture or selected area is too small, CutMyPic will stretch the image to make it fit properly. This is where image degradation occurs. Selecting an area that is larger than the framed area you want to place your image in will produce the clearest results. 8: WHY DOES THE FIRST STEP KEEP SAYING "Only PNG, GIF, and JPEGS ARE ACCEPTED" AND NOT LET ME UPLOAD EVEN THOUGH MY IMAGE IS OF THE CORRECT TYPE? Doh! That's our fault! This only occurs when our server encounters a fatal error or we've had so many images uploaded that our server is having trouble keeping up. If this happens to you, first, SORRY! Check back later as we are notified when this happens and will fix the problem quickly. The "Blur Area Select" tool allows you to blur out or censor an image or photograph that may contain data or visuals you do not wish to share online with others. Some examples may be a license plate number, phone number or address, or perhaps a face of someone you do not have the permission of posting to the web. As with the cropping tool, simply drag the 8 little positioning balls such that the area you wish to blur out is covered and press the preview button. Imagine what your image would look like if it were drawn with charcoal pastels by hand. This effect will look best with images that have high contrast and give your photo a hand crafted look. The "Clear Area Select Tool" is the same as the "Blur Area Select" tool with the exception that the area you select will remain clear, whilst the rest of the image is blurred. This may be useful when your picture has something you want to share, but it's surroundings are private and you don't want people to be able see them. Apply color filters to your image by selecting one of our filters. Color filters currently available are: Black&White, Sepia, Red Shift, Green Shift, Blue Shift, Pale Red Burn, Pale Green Burn, Pale Blue Burn, Soft Antique, Old 110, Ceramic. To see how the color filter will appear, simply select your desired filter and then click "Preview" to see how it looks. To remove the color filter effect, simply click on the left-most filter which is "none". The previously applied filter will then be deleted and your image should look the same as your original. Contrast "+" will increase the amount of contrast applied to your photograph making light areas lighter and dark areas darker. Using the contrast "-" button will decrease the amount of contrast applied to your photo reducing the overall brightness of the image and flattening the colors. Most people are here just to cut an image and go, however we've added a few other crop modes to allow you to do other interesting and helpful tasks with your photos. In addition to the standard cutter/cropper mode, you can now censor your images by blurring out a portion of the image you don't wish to share using the "Blur Area Select" too. Maybe your picture has a phone number or license plate you don't want people to see on Facebook? Perfect tool! There is also the "Clear Area Select" tool that allows you to blur everything except your selection. Lastly, we have added a vignetting select tool to allow you to add a vignette or cloud like effect that fades a color of your choice from the edge of the selected area (often seen in romantic pictures of couples or marriage pictures). Furthermore, we've added the ability to have a clear or transparent fade out of your image. This is nice when you want the image to play nicely with your website or blogs background color. The default setting for your cropper is cut. This is the primary feature of the website. To cut, crop, or select part of your image for saving, simply drag the eight small, round, indicators to highlight the area you wish to keep. When you are happy with your selection, press the "Preview" button to see what your image will look like after you save it. The image cropper in CutMyPic has 4 modes discussed at length in the help section. They are: Cut or Crop, Blur Selected Area or "Blur Area Select", Blur All Except Selection "Clear Area Select", and Vignette. For more details see the cooresponding sections in the index. Currently there are over 20 frames to choose from with more to come! From tasteful simple frames to crazy and outlandish ones, custom frames for your images and photos are a ton of fun! Simply select the area of your image you would like to frame and presto, we will do the formatting. When using custom frames, it's important that your image be of the correct proportions, so the image selection device is locked to give your image the best fit into our frame. Also note, that when you are using custom framing for your photograph, only the "Crop Area Select" can be used. Other crop modes will be disabled. The denoise feature is great for those pictures you took with your smartphone that were in a dark room or dimly lit place. It will smooth out all those annoying little dots in the dark areas of your picture. Often looks best when used with a positive contrast setting. Did you take a great shot but have your phone or camera upsidedown? We've all done it before. To flip your image right-side-up again, look just under your uploaded image and you will see four buttons. The third and fourth buttons allow you to either mirror your image (stuff on the right will appear on the left and vise-versa) or flip your image right-side-up. It's a good idea to perform these steps before editing your image as these particular functions require us to reload your page. By now you have probably seen this feature all over the internet. It's a bit of a gag feature that allows you to pinch the center of your image. The effect makes your head (or in this case my cats) look like an alien bug! This feature is most effective when the area you want to pinch is located in the center. Kids love it, cats? Not so much! Similar to the pinch feature, the push feature will allow you to explode the center of your image. This effect was made popular using images of puppies and exploding the center of the image such that the dogs nose looked overly large and in-your-face. These images were then applied from everything to refridgerator magnets to handbags. Got a dog? Give it a try! As with the pinch feature, it works best if the area you want to "stick out" is centered in your cropper. A request from one of our regular users and quite a useful one, ratio locking is here! When you want a perfect square or circle, you'll want to click on the "1:1" ratio locking option. This locks your selection area into a perfect square. If all the sides of your photograph are not the same length and height, your image will not appear as a circle even with the rounded corners slider set to max. To achieve a perfect circle image, set ratio locking to "1:1", select your desired area, and then set the rounded corners slider to max and presto! Furthermore, you can select the "16:9" feature for that horizontal, cinematic feel! This feature will reflect your image giving it a mirror effect as if your photograph was sitting on a glass table. As this effect requires your image to have twice the height to allow space for the reflected area, images that are over the 500 pixel limit will be shrunk such that the overall size does not exceed this limit. Reflecting images of text can create a cool title effect. Similar small product images can also benefit from this effect, giving them a showroom feel. It's a common problem that when you take a photo, you are holding your phone in a strange orientation and you may have to rotate the image later on. After you have uploaded your image to CutMyPic, look just under your uploaded image and you will see four buttons. The first two will allow you to rotate your image 90 degrees in either direction. Simply click the rotate button in the desired direction and the page will reload with your image in the correct orientation. Since a page reload is required for us to reposition your image, it's important to perform this step before making other modifications. Although rounding the corners of your image or photograph seems like a simple task, when we created CutMyPic, nobody had a tool to accomplish this. To round the corners of your image or picture, simply drag the slider control to the right. Remember, the slider will be more sensative when the image you are rounding is smaller. Respectively, larger images will be less sensative, so larger amounts of rounding will be necessary to give the effect you want. After applying some rounding to your image, simply click the "Preview" button below to see the result and adjust accordingly. Give your photo a shadow effect with the slider control. The more you drag the slider, the darker the shadow effect will be applied to your image or photograph. As you drag the slider, you should see a preview of the darkness above. Choose the desired amount and check your image by clicking on the preview button. Sharpen your image or photograph with the sharpen feature. Slightly blurred images will appear a tad sharper. If the image is already fairly sharp, this feature is not recommended as lines and artifacts may start to appear in your photo. Currently only the English alphabet is supported with this feature. We hope to support other languages in the near future. Use the "Top Text" and "Bottom Text" boxes to input text you would like to appear in your image. Text insertion can be fun for short notes, phrases, memes, or even short poems, etc. Features include text positioning with left, center, and right justify. You can also add text shadowing, and outlines to the text image as well. When these two features are enabled, you can also choose the color of which the process will use to shadow and outline your letters. If you want your text to appear on multiple lines, click the return button just left of the "X" button which clears text. Clicking the return button will create a new line of text using the code "[NewLine]". You can enter this in manually if you wish. Lastly, you can choose font size and styles to the right of your color pickers. Create your new meme, ad, or send that sweat heart a dear message with text input overlay! Give your photograph a toy-like feel with Tilt-shift. This feature tends to have a greater impact on images taken from a distance where the subject lies in the center of the photo. Often used with images taken from tall buildings of cities or construction sites, etc. Tilt-shift works by tricking the viewers perseption of size by blurring both the top and bottom of your picture. Also, tilt-shift will enhance the color and contrast a tad to increase the toy-like feel. Transparent/Color Replace was designed to give you the ability to cut out shapes from simple backgrounds of a single color leaving the background transparent. Additionally you can use this tool to replace one color with another. To utilize this tool, first you must turn it on using the power button on the top left of the box. Once on, choose your target color. The default target color is white. You can either manually select a target color, or CutMyPic can auto-detect a background color if you click the "Detect Target Color" button on the top right. If the auto-detect color is not the color you are searching for, you can use the auto-detect as many times as you like and CutMyPic will keep looking for the color you are searching for from within your uploaded image. Once you have chosen a color to replace, you can either choose transparency as your new color or choose another color under the "Replace With" label. Generally, the best results will need to be tuned in using the "Strength" and "Edge Smoothing" sliders. Edge Smoothing will attempt to smooth out rough edges around the border of the object you want to keep. Vignetting is the effect where a color gradient is applied to the edges of an image or photograph. You can often see these in wedding pictures or images of couples. To use vignetting it's important to note that your image will be cut where you decide the vignetting should occur. Therefor, vignetting works best with images where the center of the image contains the subject and the largest area possible can be selected. Furthermore, the color of your vignette can be selected using the "Vignette Color" selector. Optionally, if your image is to be placed on a website that has a background you would like to show threw the edges of your image, choose the "Transparent Vignette" and your image will blend into your website like butter!